Maca is an herbal plant that grows in the mountains of Bolivia and Peru. It is used to promote energy, support strength, and act as an aphrodisiac for both the male & female libido. Maca Root is a well known nutritionally dense super-food which contains high amounts of minerals, vitamins, enzymes, and essential amino acids. Maca root is rich in B-vitamins and is an excellent vegatarian source of B-12. It also contains high levels of bioavailable calcium and magnesium. Balancing hormones, by stimulating and regulating the endocrine system and working as an adaptogen. This means that it responds to different bodies' needs individually. If you're producing too much of a particular hormone, maca will regulate the production downward. However, if you're producing too little, it will regulate the production upward. Menopausal symptoms. Because maca acts as a hormonal regulator, it helps to eases your symptoms during premenopause, and post-menopause. It also helps to ease hot flashes, vaginal dryness, and acts as an alternative to hormone replacement therapy. It also aids in regulating and normalizing menstrual cycles. Stimulating and nourishing the hypothalamus and pituitary glands which are the "master glands" of the body. These glands actually regulate the other glands, so when in balance they can bring balance to the adrenal, thyroid, pancreas, ovarian and testicular glands. Energy, by helping to increases stamina and endurance. Improving libido and sexual function, especially in men. For this reason, it's earned the nickname "nature's Viagra." Aiding in the treatment of impotence. 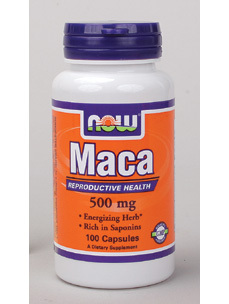 Maca increases sperm count ? oligospermia, count of mobile spermatozoids and mobility, formation of spermatozoids -spermatogenesis, increased testosterone levels. Stimulating fertility in both men and women. DIRECTIONS:As a dietary supplement take one capsule one to two times daily.